What is it? It's a clash of the world's greatest convert agencies, as a flurry of spies are unleashed upon the beaches, churches and casinos of tiny Estoril. Betrayal, seduction, conspiracies - after gadgets have been deployed and secrets revealed, who will go down as the greatest agency in history? The story goes that when Ian Fleming was a naval intelligence officer during World War II, he spent some time in a small city in Portugal called Estoril. And in this city, is the Hotel Palacio where legend has it that British and German spies would conduct nefarious dealings over martinis at the bar. This quiet seaside town also happens to be the home of the Casino Estoril, which has since been mythologised as the Casino Royale. Fleming, spies and the Casino Royale should certainly be forging certain connections in your mind, and if not I think it’s best that you consider your life choices. For the rest of us however – Bond. James Bond. 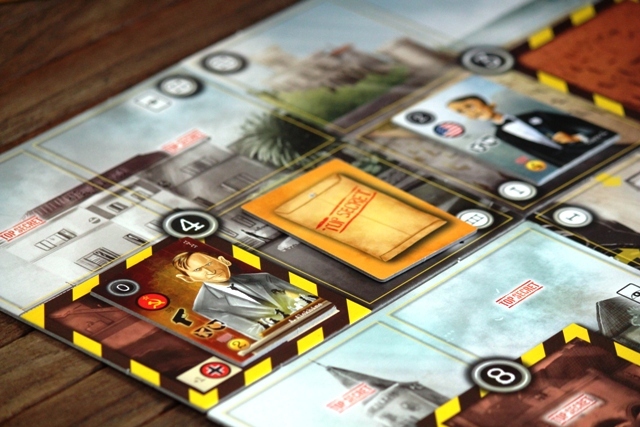 How much of Fleming’s time in Estoril affected the development of his most famous creation is debatable, but it makes for a cracking boardgame setting! It doesn’t happen all that often, but occasionally we’re given a new title to review that isn’t particularly highly anticipated or that we know next to nothing about, and as the game reaches its conclusion, we’ll look across the table, broad grins on our faces, and nod knowingly to each other. 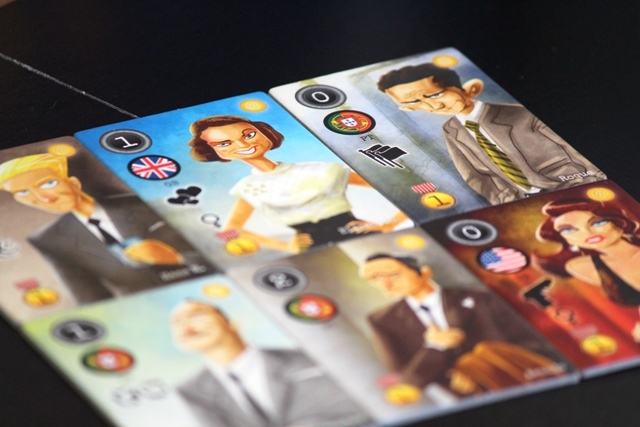 City of Spies is exactly such a game – low expectation, lasting impression. But before I get into why the game works so well, and what it is that makes it feel fresh and engaging, let’s dive into a brief overview. The game takes place over four rounds and in each round you’ll have access to 6 randomly arranged locations (there are 8 in total) and a starting hand of 6 Character tiles (players all have identical starting hands). Characters have a strength value, a special ability, a VP value and a nationality. Each location has a reward tile, which is really just a new spy drawn from a stack of 27 unique characters, and up to four open spaces (or Deployment spaces, as the game calls them). 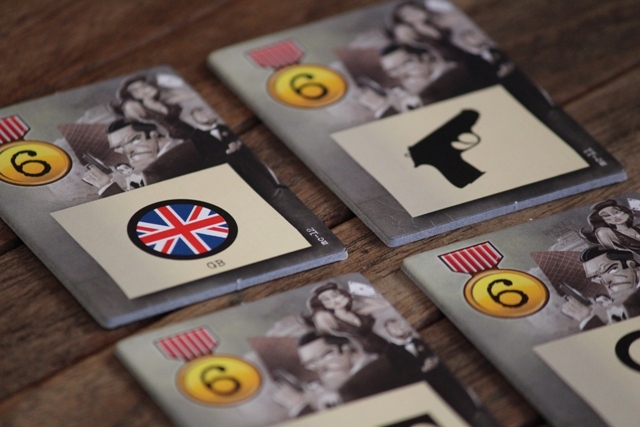 You’ll place one spy on your turn to an open space, and at the end of the round the player with the highest total strength in a location gets to add the reward tile to their existing hand of spies. After each round, players discard down to six characters, discarding tiles face up. And at the end of round four, the player with the highest VP tally is the winner, with discarded characters counting as 1VP each. Sounds pretty simple, right? But like the greatest of spy thrillers everything seems placid on the surface, until explosions and madcap escapes and daring assassinations ensue. And City of Spies is no different, thanks to a number of smart twists and the devious way in which they combine. Those special abilities I mentioned earlier? Some spies are Assassins, able to kill another spy at the same location. Others are skilled at Seduction, drawing spies away from an adjacent location. Diplomatic spies can protect their comrades from assassination or seduction and so on and so forth. When sending one of your spies into the city to recruit, for the most part you’ll play them face down to a Deployment space, keeping their strength and special abilities hidden from your opponents. But this is a game about spies, so it’s only logical that information doesn’t remain hidden for long. Certain Deployment spaces might allow you to peek at a face down spy in the same location or one adjacent, and since Reward tiles are sometimes face down too, you may face a conundrum – do you look at what your opponent has played to that location, or do you perhaps check to see what that hidden reward tile might be? And if the hidden reward isn’t all that valuable, do you bluff your opponents into thinking that it is? Not enough covert activity for you? Don’t fret, there’s more. Each location also has a special function – you can’t assassinate in the Church, at Tamariz beach all spy tiles are deployed face up, at Hells Mouth Rock the spy with the lowest strength after the location is resolved gets pushed off the cliff (discarded from the game), are just a few examples. Also, each location is numbered and locations are resolved in ascending order, which means that if you get your combos right you can often have a spy count in more than one location. Play your 5 strength spy to a low number location and your seduction spy to a later one, and if all goes well that 5 strength will count in the first and second locations thanks to that seduction ability. Deployment spaces are also numbered and resolve in ascending order, so an assassin played to a lower number will shoot first. Finally, there are also 12 Mission tiles, which are scoring bonuses for the end game. Four of them will be available per game, and they award 6 VP to the player(s) with the highest tally of a certain type of spy. For example, for the most seduction spies or the most American spies etc. I won’t delve into further rules minutia, as that hopefully gave you a clear enough overview. So how is it that City of Spies seems to work so well? 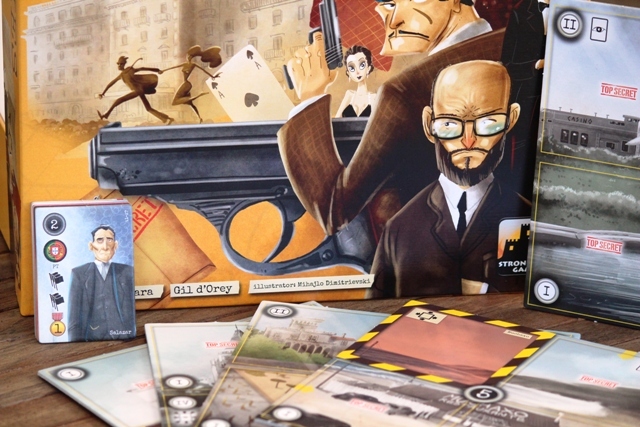 Initially it’s the theme, from the artwork that nails the tone of the game to the mechanics of spreading your secret network of spies across the board, but eventually it’s not so much that the game makes you act like a spy, but rather that it forces you to think like one. To achieve success, you need to think two steps ahead of your opponent, to master the art of the bluff and to embrace the act of ruthlessness. It’s a game that is very easy to teach, but keeping all the permutations to mind and identifying the path to the most valuable rewards can prove tricky. You’ll need strength to win additional spies, but generally the higher the strength of a spy the lower their VP value. 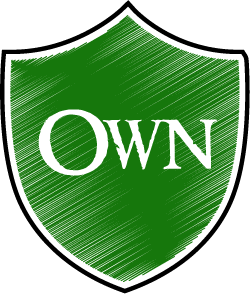 Do you play to simply ensure your own team’s success in recruiting, or do you attempt to shut your opponents out? You also need to keep a balance of spies with special abilities – sitting with only one assassin in hand after round three is a sure fire way to fail. And which spies have you had a peek at? Can you recall? There’s nothing worse than secretly looking at an opponents spy only to realise you’ve done exactly that two turns ago. What surprised me most about City of Spies is how much I enjoyed the strategic aspects. It’s easy to love backstabbing and messing with your opponents plans and many boardgames that emphasise those traits tend to be a little light on the strategy, but here’s a game that let me enjoy the process of laying traps as much as the result of them. 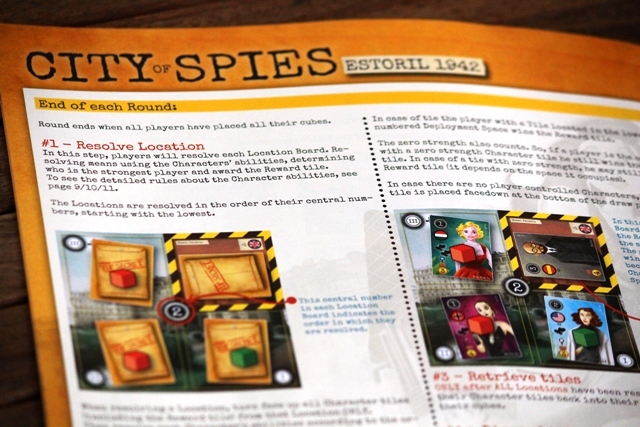 I didn’t explain it in the overview, but there are also rules governing where and when you can place your spies (you have to start on the outer spaces and work your way in) and often the most valuable spots on the board are those it may take you a few turns to secure. This adds a level of strategy more akin to the abstract genre, not so much that it distracts from the major strategy but just enough to keep things interesting. There’s certainly an argument to be made that players with stronger memories may perform better. Since reward tiles must be shown to all players when taken, and discard tiles are also open to all players, you could theoretically go into a round knowing exactly what spies your opponent has in hand. But it’s one matter possessing perfect knowledge and another thing entirely in planning an approach built on it. But if players do feel that an opponent may benefit more than the others, you could simply house rule that discard and rewards remain secret. A quick word on component quality – we appreciated the use of tiles instead of cards for the characters, their more robust nature makes them easier to handle and use in the game, and the artwork seems to have found just the right balance of charm without veering too far into the realm of cutesy. The locations themselves could perhaps do with a splash of colour, but given the need for clear iconography it’s a decision we can live with. Each player will also receive coloured cubes which they use not only to keep track of which spies are theirs, but also the number of spies they can place per round, as it ranges from 6 cubes in a 2 player game to 3 cubes in a 4 player. As you’d expect, the chaos factor differs at various player counts with 2 proving a tad more strategic and 4 offering more opportunities for being dastardly . It’s always good to be reminded that in all the Kickstarter craziness of fancy miniatures, under the layers of pomp and circumstance, the industry is still producing clever, engaging and solidly playable games that focus purely on the experience delivered rather than the manner of delivery. City of Spies shouldn’t be for your eyes only, we enjoyed the living daylights out of it. Don’t say Dr No, after all you only live twice. Many thanks to Solar Pop Distribution for providing a review copy. In the past, I've struggled to identify genuine negatives in certain games that have nevertheless still left me feeling somewhat neutral on them. I can't really think of any impactful cons for City of Spies, but I'm decidedly more enthused by it. It manages to pack just enough planning and take-that elements without unnecessarily inflating the game's runtime. Something a little different, we'd be more than delighted to see a copy of this on the CBQ shelf.